The M/V Sally Fox has started service today on the Vashon Island route. 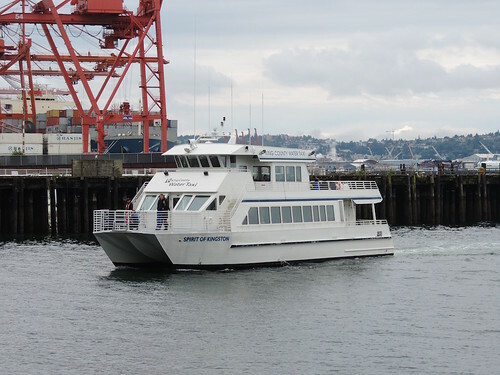 This vessel is the first of two "brand' new vessels owned by King Co. Water Taxi. The two new boats will replace the Melissa Ann which was leased and 27 yrs old. The second vessel will put the Spirit of Kingston as a backup boat. Hey I know the guy who wrote that KING 5 article! Anyways here's my favorite picture of the Sally Fox I took while en route the dedication ceremony. Traveling to the dedication was actually really cool, the media folks got to stand on the back of the Spirit of Kingston and take photos of the Sally Fox as it chased us around Elliot Bay and the Puget Sound. The Sally Fox is a beautiful ship. I have a lot more pictures up on this Flickr gallery. 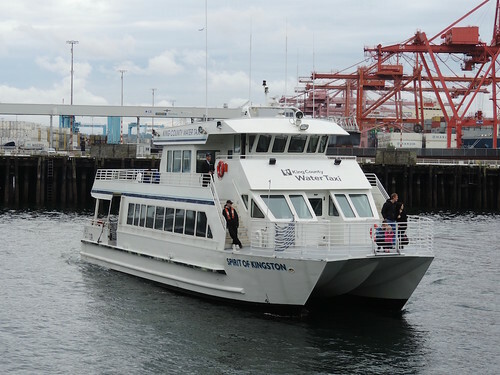 One more boat named the M/V Doc Manyard will enter service on the West Seattle route after she is done sea trails. 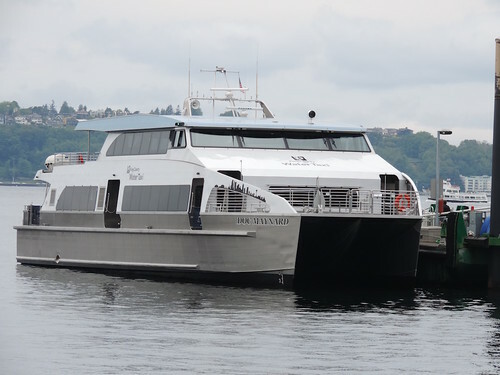 I hope the M/V Doc Manyard will bring the off-peak and weekend service to West Seattle route during the off-peak season months. Yup. The Doc Manyard is expected to be delivered in mid-October 2015. The Sally Fox got about a months of sea trials, assuming a similar schedule the Doc Maynard will go into service in November/December 2015. At around the same time the Melissa Ann will be returned to Four Seasons Marine Services and the Spirit of Kingston will become the backup ship. I'd love that too, but the Doc Manyard is just a ship... it can't do something like that. The human politicians that work for King County would need to find the funding to make year-round off-peak and weekend service happen. 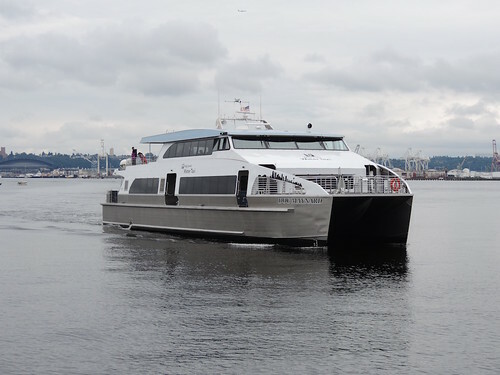 Also worth mentioning that for the last month the the first few runs between Seattle and West Seattle on Saturday are being made by the Melissa Ann and after that the Spirit of Kingston takes over. Not sure if that's due to required weekly maintenance on the Spirit of Kingston, or simply that they want to get the Melissa Ann out on the water once a week. 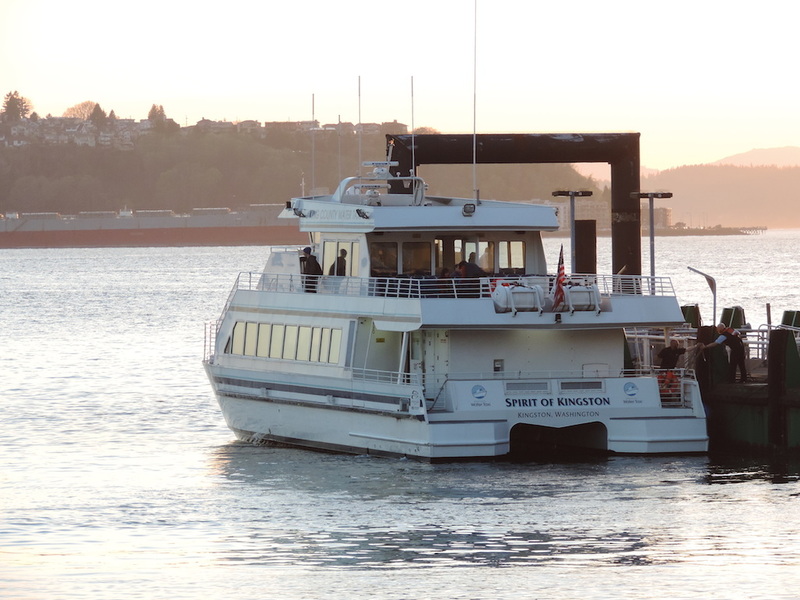 The M/V Doc Maynard will first enter service on the Seattle to Vashon Island route for the M/V Sally Fox goes in for warranty work. By the way, King County Water Taxi may expand onto Lake Washington and add more sailing, and routes on the Puget Sound. • Ballard (Shilshole Marina) to Downtown Seattle (Pier 50). 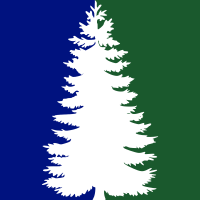 The county's Transportation, Economy and Environment (TrEE) Committee will officially receive the interim today. The final report on expansion is expected to be finished by November 25, 2015. I think they expand the West Seattle route to operate seven days and off peak to all year instead of peak season and expand the Vashon Island route to off peak in off peak season and seven days with off peak service during the peak season with the couple of routes that might come into play. So the Doc Maynard arrived in Seattle over the weekend. The plan is to have a dedication ceremony Friday at 11:30. After that Doc will go into service on the Vashon Island run for a while so that the Sally Fox can go back to the builder in Bellingham for warrantee work. 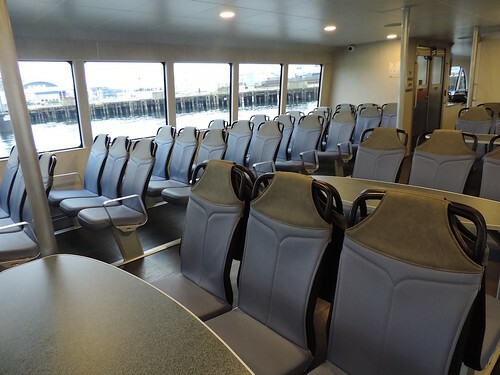 He's a great looking ship and as West Seattle commuter, I'm very excited. I've noticed a few differences between Sally and Doc. Doc has a new King County Water Taxi logo. It has the image of Dr. King and looks like the King County Metro logo. Also the metal beams at the bow of the ship have a decal of Seattle skyline. Picture from @kcnews on Twitter. 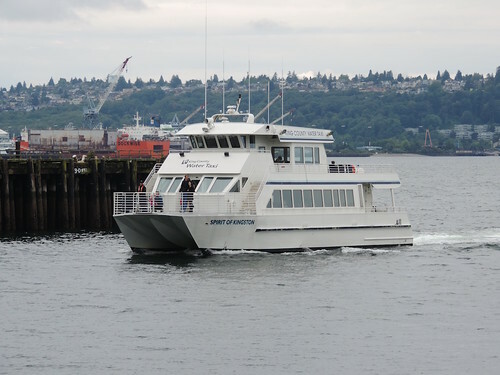 Do you know if they going to increase services in the off season on West Seattle when she enters service? The off-peak/Weekend service is heavily dependent on tourist traffic to pencil out financially... and there just isn't enough tourists between November and March. Couldn't they write schedule that matches the demand of off season? They did. It involves having no off peak or weekend service. I wonder if ridership increase next year would KC Marine division consider increasing services on the routes. 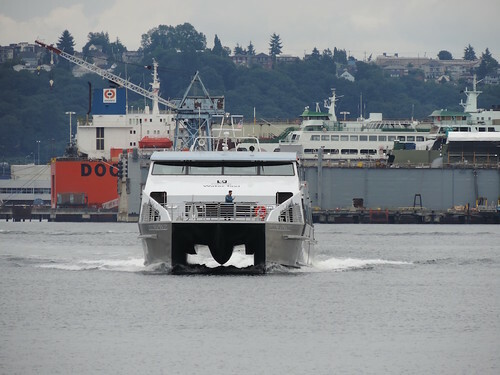 The M/V Doc Maynard entered service this morning on the West Seattle run. The run in particular is anticipated to have a short surge in ridership during the planned closure of the Alaskan Way Viaduct in March (when Bertha burrows under). 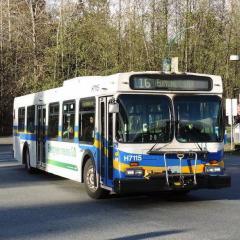 Do they often use the Spirit of Kingston on the West Seattle Route during the weekends? No. Normally the Doc Maynard continues to run on the weekends. That said, I've noticed that if the Spirit of Kingston will sometimes make an appearance on the first few runs of the day on Saturday. I'm not sure the reasoning behind this. 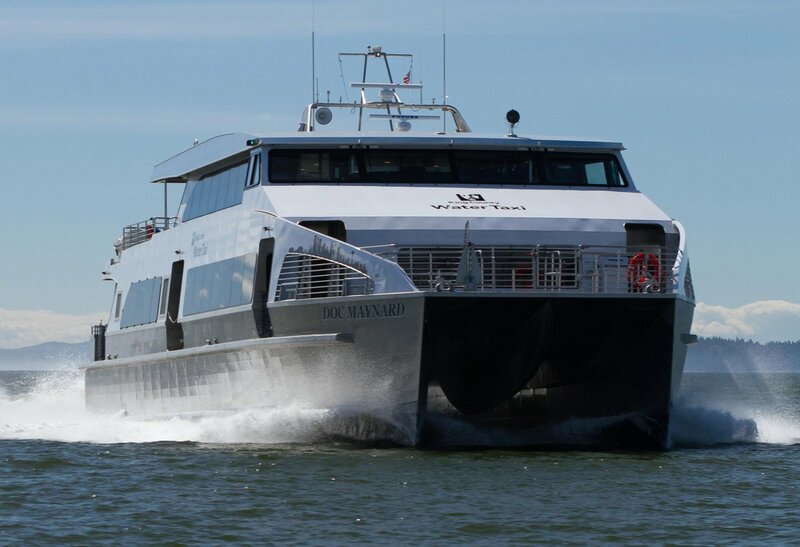 Maybe they just like to run the Spirit of Kingston once a week to make sure everything operates correctly, or if the Doc Maynard is scheduled for routine maintenance on Saturday mornings. 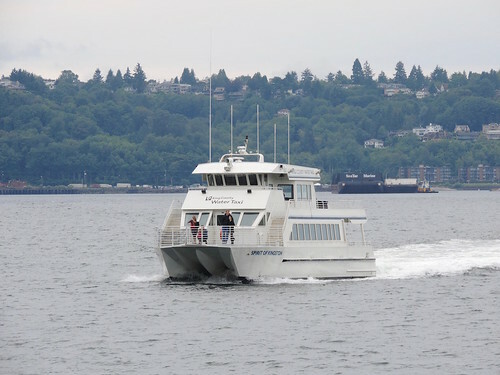 I wonder if ridership stays like this during the winter will they consider adding more sailing on both routes; with West Seattle seeing midday service during the winter and midday sailing on the Vashon route all year. I wonder why M/V Spirit of Kingston is in service today?